I have eagerly followed Maria V. Snyder's work since her first novel set in the fantasy worlds of Ixia and Sitia, Poison Study. By far, my favorite characters in those worlds have been Yelena and Valek. I was delighted when she returned to those characters in last year's Shadow Study. Night Study picks up right where Shadow Study left off. Yelena is dealing with the loss of her soul finding abilities after a magical attack. It appears that an old adversary, Owen Moon, may be responsible. In fact, multiple assassins are after Yelena. Valek is trying to balance his duties to Yelena against those to the Commander of Ixia. The Commander himself is not making that easy, so Valek is very conflicted. To add to the mix, war is brewing between Ixia and Sitia, placing Yelena in the middle, as she is the liaison between the two countries. 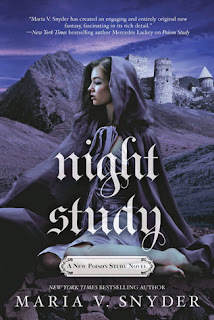 Told in multiple POV's, those of Yelena, Valek, Janco and Lief, Night Study is high adventure from start to finish. Big changes are on the horizon for not only Yelena and Valek, but the two very dissimilar countries they represent. I am looking forward to the final installment, Dawn Study, to see how it all works out. Thanks to MIRA and NetGalley for an advance digital copy in return for an honest review.